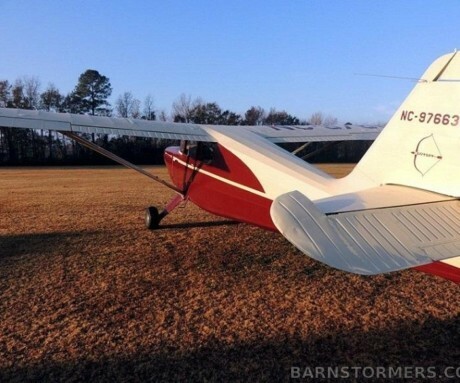 Stephanie Belser contacted me this morning with the news she is selling her Stinson 108-2. Stephanie writes, “Last year I developed a medically-disqualifying condition. I had to give up flying. My Stinson is for sale, so if anyone in the Midwest is interested in a flying 4-seat taildragger (not the nicest looking, maybe), feel free to drop me a line. I did leave the airplane at KFAM and it’s being cared for.” Anyone interested, please email me at ladytaildraggers@gmail.com for Stephanie’s contact info. Previous post: Stephanie Belser has relocated from New York to KFAM, Farmington, Missouri. Here’s the latest from Stephanie. 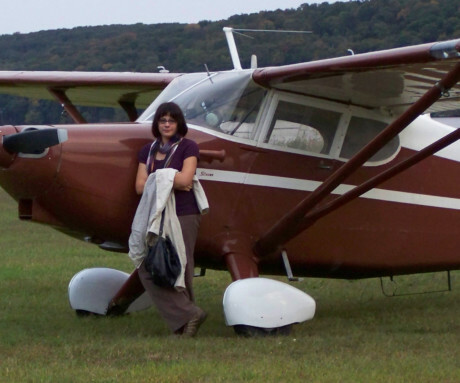 Stephanie sent along a nice write up about flying her Stinson from NY to its new home base at KFAM she wrote for Avsig. Thursday afternoon (May 18th), I got a ride from a friend to STL and rode two UAL RJs to PVD, where a friend picked me up. From the time I left Farmington to arrival at my friend’s house was 9.5 hours. I had originally planned the flight with stops at N79, PHD and HFY. HFY was chosen for its supply of motels in the vicinity, since I was hoping to do the flight in early April; a straight push through would have meant that the last couple of hours then would have been into a setting sun. I also planned for a headwind and 11-12 hours in flight would have meant for too long a day. I also didn’t have much hope that I’d luck into a good day for the entire trip, I planned on being able to set down and spend a day or so for the weather to clear, or to do the legs of the flight only in the morning before thunderstorms fired up. I did an extensive pre-flight the day before; had the line guys top the tanks to make up for evaporative losses over the previous five weeks, took the wheel pants off to add air to the mains (and put them back on), added oil to bring it up to the 7 qt mark, looked around for birdies and brought some stuff out to the airplane. Navigation, well, I may have been a little much there. I chose a route that was between VORs, even if the radials weren’t airways. I set the routes into my Garmin 195 and I had lines drawn on the charts. But there was a tailwind until the mid-afternoon and it was pretty decent in the morning. Stopping at N79 would have put me on the ramp with less than two hours of flying, so I pushed on to State College, PA. I went into UNV because landing at the other two airports there (N96 or PSB) would have meant screwing around somewhat with UNV’s Class D, so I figured what the hell, just land there. That was 2.4 hours. The GA facility at UNV is really nice. (It was the only time that I talked to any flavor of ATC.) The only traffic I saw was a FedEx C-208 that landed just after I did, though I did hear a United RJ coming up on freq for departure after I left. 2.4 hours from GON to UNV. I was away from GON before the tower opened, I cruised at 4,500′ for this leg. I had Unicom up on the radio as I flew towards the Carmel VOR, I heard a Cessna calling in on a 45 to the downwind at 44N. I radioed him and asked him to say “hi” for me at the desk. He said that he would. I pushed it on the second leg, 2.9 hours to I12, Sidney, OH, which I flew at 8,500′. Not only was it getting to be a hot day and I wanted to fly in cool air, it was a nice ride. There is a huge test-track surrounding an airport called “Transportation Research”, approx. 40-19N, 083-33W, just southeast of East Liberty, OH. The air over eastern Ohio had a funny smell to it. I landed at Sidney because that was not only the name of my mother’s dad, my sister named her dog that. It was a good thing that I was using redundant nav, as the GPS went “poor satellites” 20 miles out of Sidney. The last several miles I followed some railroad tracks to the town and found the airport. They were super nice at Sidney; a couple of women came out from the office and assisted me in fueling. Very pleasant facility and the airport manager came out to chat as I ate a sandwich. They have sodas and water in a fridge, pay on the honor system. I added a quart of oil to bring it back up to the 7-qt mark. I saw two airplanes land at I12 while I was there, making it the busiest airport of the day. Out of Sidney, that’s when I initially climbed to 10,500′. Really, that was because I wanted to see if I could get up that high, even if the VSI had to switch over into “calendar mode”. One does not simply fly into Mordor. DCY was the next stop, because I thought that shorter legs would be better for the last part of the trip. Navigation was a little weird, as there is an interstate under construction that does not show up on the St. Louis sectional (better that than a 3,000′ tower). 2.0 hours to DCY. I landed there a little after 4PM local time, the guy in the airport building was more interested in cleaning up than anything else. Other than that, I saw not a soul or an airplane in motion. I did hear one guy call in on Unicom just after I left.The last leg to Farmington was at 4,500′. That got me out of the “weekend sightseeing” altitude, but I didn’t try to go over the scattered clouds, for they might have built up too high. Also, my route of flight took me under the Red Hills MOA, but if I wanted to chance going above the clouds, I’d have called Indy Center. About all I can say of the last leg is that it was summertime afternoon flying, but no thunderstorms. I ended up bagging VOR hopping and went for GPS direct to shave a few minutes. GPS again went “poor satellites” as I crossed the Mississippi River. I had the FAM VOR dialed in anyway, I used that and I was able to pick up a road I knew, MO state route 32, which runs from Ste. Genevive (“Ste. Gen” in the local parlance) to Farmington. 2.0 hours there from DCY. 9.4 flying hours, 11.5 hours en route, 13 hours door-to-door. I had to open the GPS manual to refresh myself on how to activate a route (it’s been several years <g>), I managed to cut open a finger on something while loading the baggage compartment (blood, bandaids) and when I arrived at FAM, I had to fit and trim new tiedown ropes. All that added time. My airplane is in a shade hangar (which is why I needed the ropes). After a few flights, I became rather paranoid about smacking a hangar support with a wingtip, so this was my painting job for the weekend (6/16). The white stripes should be obvious (and the airplane is a little bit off-center). The red stripes are warning stripes, they give about a 6″ warning of “you’re going to hit the hangar, moron”. They’ll save time, because I was always stopping while moving the airplane in and out to see if there was indeed room between the hangar supports and the wingtips. Heather Gamble – Formation Training! What I should have mentioned is that I moved the airplane from 44N to KGON in early April because I have a friend who lives near that airport. That made getting to the airplane a lot easier. My only concern was that KGON is known for morning ground fog (local pilots call the field “Rotten Groton” for that reason), but it wasn’t a problem that day. Anyway, if you’re flying through KFAM, drop me an email at smbelser@gmail.com.